On Thursday, December 9, five UK students, two BCTC students, and three community activists delivered a total of 186 petition signatures to the management of the Euclid Avenue Kroger grocery store. We are asking Kroger to support just wages and humane working conditions for the immigrant farmworkers of Immokalee, Florida, by agreeing to pay one cent more per pound of tomatoes and to enter a code of conduct agreement opposing the sale of products made by victims of enslavement/human trafficking. The local manager took the signed letters from us and agreed to inform the national office of Kroger about our visit. 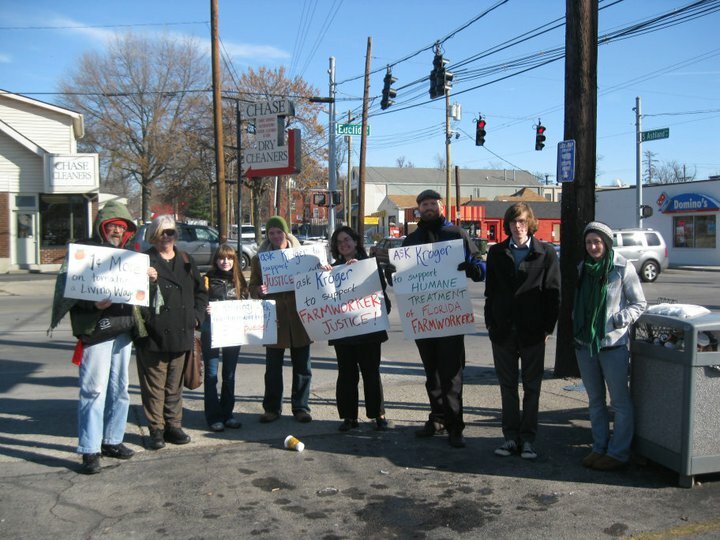 In a local campaign initiated by the UK Socialist Student Union, 186 signatures were gathered in a single week at a variety of locations, including at the University of Kentucky Student Center, the Bluegrass Community and Technical College cafeteria, the Lexington Catholic Newman Center, and local meetings of the Central Kentucky Council for Peace and Justice and of Kentuckians for the Commonwealth. This is just one step in an ongoing campaign demanding that the supermarket industry support "fair food" and negotiate with the Coalition of Immokalee Workers (CIW) farmworkers in Florida. Look for more organizing on this issue by the SSU and other local activist groups in the spring, and please contact us if you'd like to be involved. 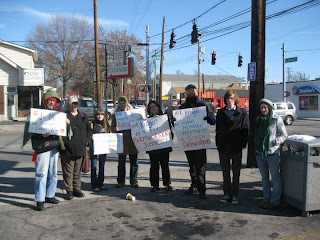 KFTC has posted a nice blog post about the action: http://www.kftc.org/blog/archive/2010/12/09/students-and-kftc-members-demand-that-kroger-supports-workers-rights/weblogentry_view. The U.K. SSU has now collected over 100 signatures on a letter asking Kroger to pay one cent more per pound of tomatoes and to enter a code of conduct agreement, to improve the wages and working conditions of immigrant farmworkers in Florida. On Thursday, December 9, at 12:10 pm, we will be assembling on the public sidewalk at 722 Euclid Avenue to debrief and then to deliver the signed letters to the management of the Euclid Avenue Kroger. All are welcome to join us in peacefully making known our concerns, as customers of Kroger, about the human rights of Florida farmworkers. For more information, contact standinsolidarity@yahoo.com or check the Facebook event: http://www.facebook.com/event.php?eid=113124448757361&index=1#!/event.php?eid=113124448757361. 72 signatures so far, and more rolling in! UK SSU gathered 60 signatures tabling on campus on Tuesday, on the letter to the management of Kroger. People were really receptive. This is a cause that it is hard not to care about, considering that conditions for these Florida farmworkers are so bad that two of the employers have even been imprisoned for beating and enslaving workers. One student mentioned that she felt a personal connection to the issue because she had a family member who was a tomato farmer. Another student--yes, we asked her to sign up for the e-mail list, and she did--said in response to our spiel about exploited workers, "Figures. Capitalism [is the problem]!" Tonight I briefed the board of the Central Kentucky Council for Peace and Justice (www.peaceandjusticeky.org) about the issue, at their monthly meeting. They were happy to sign the letter and will help us to get more signatures. The UK SSU will be tabling on the first floor of the UK Student Center on Tuesday (11/27), from 10am to 2pm. We'll be near the Student Government office. Please stop by to sign a letter to the management of Kroger. We are collecting signatures asking Kroger to agree to pay one cent more per pound of tomatoes, as part of the Coalition of Immokalee Workers' campaign for a living wage and better conditions for Florida farmworkers. Please contact me, standinsolidarity@yahoo.com, if you'd like to help table. Here is the letter to Kroger we'll be gathering signatures on: http://www.ciw-online.org/Resources/supermarkets/manager%20letters/kroger.pdf. More information about the Coalition of Immokalee Workers: www.ciw-online.org. Before the end of the semester, we'll get a group together to deliver letters and petition signatures in person to the management of the Euclid Avenue Kroger, one of the busiest Kroger grocery stores in the nation. As always, stay tuned for updates. Local student activist at risk of deportation; sign the petition! A student at BCTC who has been involved in Dream Act activism is currently at risk of deportation. Read her story and take action at: http://www.change.org/petitions/view/halt_the_deportation_of_all-american_dreamer_jennifer_abreu. Hi all! We're updating and expanding the blog, so stay tuned. Previously we were just the U.K. Socialist Student Union blog, but now that the SSU has a new branch over at Bluegrass Community and Technical College, we'll be sharing the blog between the UK and BCTC SSUs. We hope to use this blog as a tool to unite other socialist students and socialist student groups around the state. At a UK SSU meeting a couple of weeks ago, we decided we'd like to try to a hold a meeting early next semester, before the end of January, to discuss involving other socialist student organizations around the state in forming a Kentucky Socialist Student Union. We're quickly trying to pull together another UK Socialist Student Union meeting for this Thursday (tomorrow, Nov. 18) at 5pm at Coffea coffeeshop (385 Rose St., Lexington). So sorry for the short notice; please help spread the word. As always, all are welcome. It will be a fun, short meeting. :) Hope to see you then. Hi all! The next meeting of the UK Socialist Student Union will be Wednesday, Nov. 10, at 5pm at Common Grounds Coffee House (343 E. High St., Lexington). All are welcome. Hey everyone! This is a repost of my overview of the SSU's options concerning the CIW and the Euclid Kroger, sent out from the listserv. The CIW's current campaign is focused on the major grocery chains across the company. After having major successes with various restaurant chains (most notably McDonald's, Taco Bell, and Burger King), the CIW shifted their focus. Since then, 6 companies have joined (including Good Foods). Now they're focusing on other major retailers, including Kroger. Other options include printing off a postcard and mailing it to Kroger HQ. We could also rally/protest/table outside a Kroger location. However, I think our best option is obtaining an educational DVD and screening it, and then presenting either post cards or manager letters at the movie presentation. On Tuesday (Oct. 19), the UK and BCTC Socialist Student Unions will be co-hosting a performance of Howard Zinn's play Marx in Soho at Natasha's Bistro. It's a great play, written, directed, and acted by awesome people. And it's about the ghost of Karl Marx, who refuses to stay dead. And it benefits student activism. What's not to love? Stick around, if you can...after the performance, the SSU will lead a discussion about the play and about the relevance of Marx's ideas for today. Come to support local student activists! Proceeds from the evening's performance will help to fund future Socialist Student Union activities, including helping to send some students to the upcoming School of the Americas protest (http://www.soaw.org/) in Georgia in November, to meet with activists from around the country and speak out against torture and massacres in Latin America. Please help spread the word about this event! It's going to be awesome. For more info, contact standinsolidarity@yahoo.com or visit our Facebook group, "U.K. Socialist Student Union."